There are more “small works” exhibits popping up around our state. I love it! 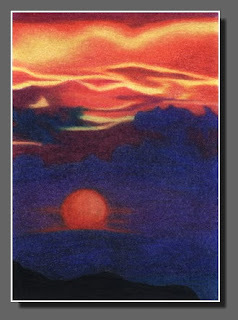 It opens up more juried opportunities for my Silhouette Sky pieces. This piece is done on Bristle Board, which has a smoother surface than the Stonehedge paper I use sometimes. I can’t put down as many layers of colored pencil, so I use this when I know that I’m probably only going to need four or five. The smooth feel of this paper is a nice change. I enjoy the meditation of the process for these little pieces. Thanks for stopping by and have a grand day! Thanks for posting it, Dee. The colors are very soothing! Thank you, Mark!! I love the colors in this one, too.